Autumn 2015 list upload - biggest ever! Well Summer has gone already, that didn’t last long did it? The good news is we have just uploaded our biggest ever listing. We have in excess of 9,000 coins now, including lots of additional foreign, especially US and Canadian. We have bought in some lovely Silver collections, with a number of modern Maundy sets, and a stunning range of small Silver. 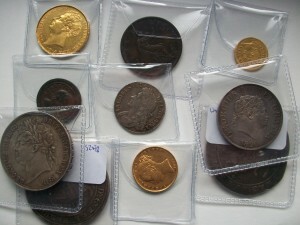 A vast selection of early Copper, much of it lowish grade and therefore affordable. We have also put together the finest collection of Third Farthings ever assembled, all of it slabbed by PCGS. As well as this we have gathered in a very large selection of rare early Copper, much of it quite cheap so do make sure you lookout for that. We haven’t forgotten Gold or Hammered and essentially we just do have lots of everything. We have reduced the prices of hundreds of our Gold coins. If you haven't already logged in or got an account with us, you need to know that we set up lots of new accounts on August 5th so there may well be an email waiting in your inbox. Do remember though that you can order coins in the old way, and we are always on the end of a phone should you want to speak to somebody. We can be contacted on 023 80324258.